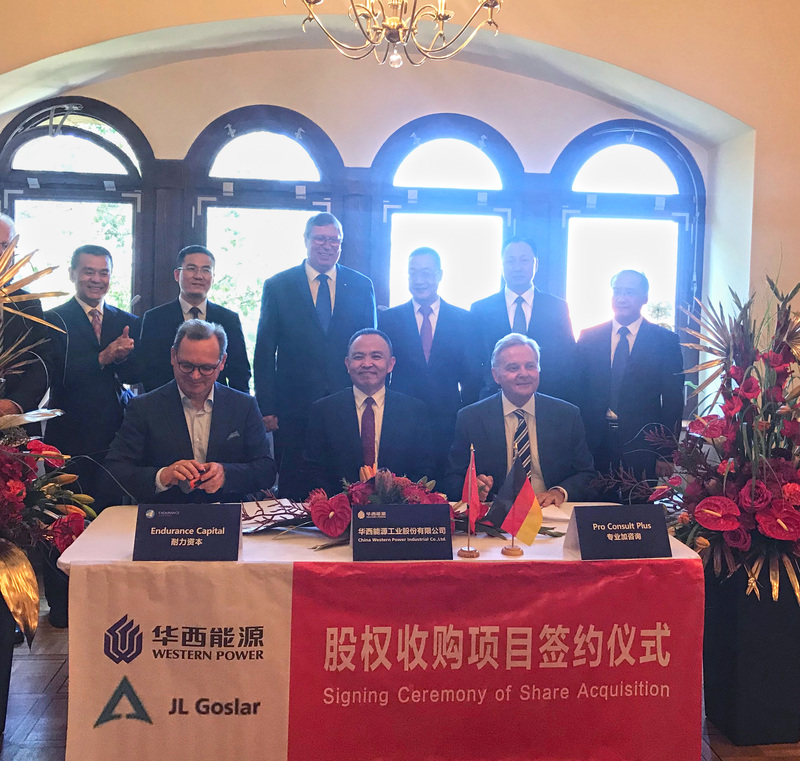 Taking the Lead in the New Era-CWPC Purchases 51% Stock Right of JL Goslar GmbH in Cash for Development of Nuclear Waste Treatment -China Western Power Industrial Co., Ltd.
As we all know that German machinery industry always takes the lead in the world. And talents of the German in aspects of mechanical manufacturing and design are beyond reach .German is known for her strict work attitude, standard system ,complete procedure and rigorous theory . In order to further promote product upgrade and business transformation, expand international market and seek for new growth points of revenue and profit, after half a year's investigation and negotiations, on July 24th ,2018 at Imperial Palace of Goslar ,Chair man Li Renchao from CWPC signed the equity transfer agreement with Mr.Matthias Uebel from Endurance Capital AG and Mr.Erhard Grab from JL Goslar GmbH,purchasing 51% stock right of JL Goslar GmbH,which was held by Endurance Capital AG and Pro Consult Plus UG before . Stock right acquisition this time is beneficial for CWPC to set up business platforms in Europe, expand markets in developed country in Europe and promote comprehensive competitiveness. Chinese President Xi Jingping met Angela Mekel, Chancellor of Germany in Beijing on May 24th .President Xi Jingping emphasized that we two countries shall be a model of win-win cooperation, stating the new position and direction of Sino-German relations. Open China forms the open Zigong which is under the transformation from an old industrial city to a upgraded one. The government of Zigong sees the development and investment & capital attraction as priorities and the key to revitalize development and assist transformation and upgrading.On July 24,Zhang Bangju , Municipal Standing Committee, Secretary of party working committee of high-tech zone ,with his delegation visited German and met with shareholders and management of JL Goslar GmbH and attended the signing ceremony . JL Goslar GmbH is in the central region of Europe, where degree of development of finance and manufacturing industry is quite high. It has more than one hundred years’history, which has quite strong brand advantage in the field of radiation protection device, vessels, industrial components and anode material, etc.Technologies for nuclear waste treatment take the lead in the world .However, nuclear waste treatment has huge potential in Chinese market. In order to expand industrial chain and enter new field, acquisition this time of CWPC could be beneficial to import state-of-art technologies, promote product and technology upgrade and business transformation, while for JL Goslar GmbH,it can expand its market in China with the assistance of manufacturing capability and market resources of CWPC . It is a cooperation based on pragmatism, mutual trust and win-win ,which is complementation of the reform and opening-up of new round and is the turning point for CWPC to expand European market .